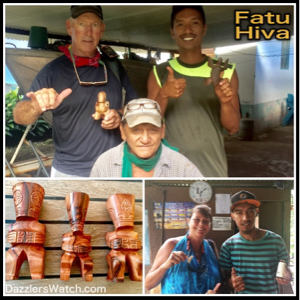 We left Fatu Hiva and made the 40 mile trip north back to Tahuata. At least this time it was with the swell and wind instead of against it. 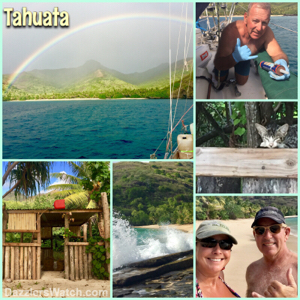 Yes, Tahuata is the beautiful spot we were at just about a week ago. As we neared our favorite anchorage we note several boats were there so we would not have it all to ourselves as we did the first time. It’s not a very large place so we opt to go a bit further north to the next anchorage. The last time we were here there was at least a dozen boats but we’ll give it a shot. It turns out there are only two other boats so we drop the anchor. Just after we get the anchor down and pop our anchor down beers we are greeted with the most wonderful sight. There is a rainbow over the beach that actually begins and ends in the water. I’m 50 years old and I’ve never seen the ends of the rainbow. OH MY! What a truly spectacular sight. It literally goes into the water. Nope, I’m sorry to say there is no pot of gold on either end but I will tell you this, if you ever get a chance to see this you will never forget it! There’s a light mist in the air and we are basking in the glow of the afternoon sun and the rainbow. Can it get any better than this? We certainly don’t think so. Today we awoke to another beautiful day here. The sun is out and we are enjoying this lovely anchorage but there is work to do. Dan needs to clean the bottom of the boat and I’ve got laundry to do. Yep, back to the bucket and the rail-side wringer. I’ve got clothes hanging down both sides of the boat in two rows. It’s amazing how quickly laundry backs up out here. It’s about this time that I’m truly missing the cheap laundry places of México but you know, if you have to work, you might as well do it in paradise. That’s our motto anyway. Soon the laundry is almost done and we are kicking back with a beer to reward ourselves for our hard work. I go to pull down a couple more items from the line and find what looks like rust stains. Ironically they are all on my clothes and not on Dan’s. To say the least I’m not happy about it. We begin to search out the culprit. It turns out it’s not rust, it’s cedar stain from wet cedar in my locker. The wastewater fitting on the deck is leaking and right into my locker. Arghhhh! Now Dan has to remove it and reseal it, which requires me to remove all my clothes. What a mess! When he removed the fitting he found a crack around it. Ever Mr. McGuyver, Dan pulls out the liquid weld and fixes it. No, it’s not a permanent fix but one that will get us to Papeete at least. A couple of hours later and the leak is fixed and I’m reloading my locker. Now it’s time to head to shore. I’ve been dying to walk the beach here as it is truly beautiful. We pull up on the beach and pull the dink ashore. The surf is a bit rough and the tide is coming in. We walk just a short way away from the dink when we see a wave come crashing in that lifts it off the sand. We walk back and Dan says he’ll stay here to watch it while I walk the beach. It’s certainly not what I wanted but I do want to get some great photos here so off I go. I walk up along the tree line and find some huts and other things. They make copra here. The one bamboo hut reminds me of Gilligan’s Island. I even spot a small kitty lying on a table just enjoying the view, the scents and the sounds. He or she looks like the happiest kitty I’ve ever seen but then why not? Wouldn’t you be happy just sitting under a swaying coconut palm watching the waves crash on the beach too? I would explore a bit deeper into the dwellings but there is a sign that asks that you stay on the beach. Unlike a lot of cruisers we’ve encountered I will honor their request. After all, this is their property and even though no one is here to see me, I will do the right thing and keep my distance. My walk along the beach is beautiful but lonely. I would much rather have Dan here beside me so I don’t walk as far as I might have otherwise. I do get some truly spectacular shots of the anchorage, the beach and some of the huts before heading back to Dan & the dink. We get back to Dazzler and sit in the cockpit enjoying the sunset in this amazing place. No, it may not always be sunshine and cocktails here but we work through it and we are rewarded with breathtaking rainbows and stunning sunsets. Life is truly wonderful! As we arrive at the quay to make our hike to the waterfall here in Fatu Hiva we are greeted by a local woman, named Riva. She speaks fairly decent English and we seem to be able to communicate rather well. She walks up the road with us asking if we want any fruit and she also lets us know she can make us dinner. Down here it’s common for the locals to make dinner for cruisers, of course they do it for a price. It’s their way of making a little money and sharing some of their local culture. We tell her we will think about it. We do ask her about finding a tiki carver. We are interested in purchasing some tikis as we’ve heard they have some of the finest carvers in French Polynesia here on the island. Riva leads us down the main road to the home of a man named Leona. I believe she tells us he is her uncle. His son escorts us into the covered carport where the tikis are carved. There is a fishing boat on a trailer in there as well. On a small table there are all sorts of tikis. Some are large, some small and some are not even finished yet. We look through them admiring the fine detail work that he puts into them. There is one that catches our eye that has the most beautiful wood grain to it. This one isn’t finished yet but Leona tells us if we want to buy it he will finish it while we were on our walk. “Really? You can do that in just a couple of hours?” we ask. “Oui, Oui.” He says with a giant smile. We pick out two others that we want and tell them we’ll return after our hike. If you read the previous story you know about the hike to the waterfall. If not, you can read about it on the article posted June 13th. It was quite a hike. After our long hike we return to the village and stop by Leona’s home. He and his son greet us and show us the completed tiki. Oh my, it’s so lovely. What fine work this man does. In broken English he invites us back into his home and introduces us to his wife, Florida. I’ll always remember her as that’s where I’m from. We walk into an open-air room where they literally have hundreds of tikis all wrapped up. His son explains that they will be sent to Tahiti and other islands to sell. Glad we got ours here at the source. They will be much more expensive in Tahiti. We paid 4000 CFP, which is about $40 USD for all three. In Hiva Oa I saw them and they wanted 4000 CFP for just one and they came from this very village and likely this carver. Talk about simple living. As we wait for Florida to wrap our tikis I scan the home. There isn’t a single door or window, simply openings. No screens to keep the critters out either. In the next room I see a mattress, a pretty thin one, lying on the floor. In the adjoining room I see a small table and a couple of hard wooden chairs. As with most island homes here the kitchen is outside. I guess that helps to keep the critters outside instead of inside. Their walls and floor are bare concrete and there isn’t a knick knack lying about nor is there a picture to be found on any wall. The only things hanging on any wall were two Marquesan, eight-string ukuleles in the “tiki wrapping” room. Dan asks Leona if he can hold an ukulele and he nods in approval. Dan has never played an eight-string ukulele and he’s thought of purchasing one while we are here. He strums it a bit and hangs it back on the wall. It’s out of tune and not really what he wants. After ten minutes or so we are ready to leave. I ask Leona if we can get a photo with him and his son. He agrees so we step back out to the carport and I take a couple of shots. Interestingly in two of the three shots he and his son look off to the side. I can’t help but wonder if that has something to do with their culture. Hmmm…. Tikis in hand we head back to the boat to rest up from our hike. The following day we head to the village to seek out a bone carver. Here they carve all sorts of cool things from the bones of hogs and fish. They carve these absolutely beautiful swords using the bill of marlin. I’m specifically looking for some earrings carved from bone. At the quay we see Riva again and she leads us to her home where Poi, her husband, is a carver. Her home is directly across the street from Leona & Florida’s home. We walk up to the modest, open-air dwelling and onto a large, covered porch. The porch has a long picnic table set with a tropical print tablecloth. To the right, up two steps is another open-air porch that has two rooms at the back of it. These are their bedrooms. Once again, no doors or windows, only openings. They do have this beautiful carved wood opening along the railing though. No doubt that Poi carved it. Riva gets a big piece of material and lays it on the table. Then she begins to lay out the carved pieces they have to sell. His work is beautiful and exquisitely detailed. It’s hard to imagine the time it takes to create even one of these works of art. Unfortunately they do not have earrings that are like what I’m looking for so we kindly explain we will look elsewhere. Riva does get us to agree to come back for dinner later. She even gives us a handwritten “ticket”. I can’t begin to tell you what it says or means but we know we have to be back at 1730 for dinner. As we leave their home the skies open up and the rain begins to fall. We are basically stranded here with no umbrella. Fortunately I have my trusty Columbia rain jacket that folds into a pocket in my backpack. As we stand under a tree waiting out the rain Dan has a thought, “Did I close the forward hatch?” Oh no….this could be very bad as that hatch is over our bunk. Off we go in the now drizzling rain. He jumps in the dink and heads to the boat while I stand with a local, his son and a cruiser beside a bench that is covered here at the quay. I strike up a conversation with the cruiser. He’s a young man, maybe all of 25 years old. He came over as crew on a boat from Panama and likes Fatu Hiva so much he’s decided to rent a place and stay for a few months. When he’s ready to leave he’ll find another boat and crew to the next place. Wow! What a life! Oh to be that young and be traveling the world like this; I truly envy him. He seems to be a smart young guy and I enjoy talking with him but soon Dan returns and we must head to find the bone carver. Just up the road from the quay is a sign pointing to the left that says, “Bone Carvings”. That looks promising so we decide to follow it and see what we can find. We see another sign on a house on the left just a short way down the road. Dan walks up but no one appears to be there. A lady up the road sees us and walks back to help us. Soon she is calling out for the bone carver. He is across the street and comes over to greet us. He speaks about as much English as we do Marquesan. This will be interesting. He guides us to a table under a roofed carport that is literally packed with stuff. And, in the midst of all this stuff that to most would appear to be junk is a late model Toyota truck in excellent condition. The Marquesan people put a very high value on their cars. They may have virtually nothing else by many of them have very nice vehicles. His girlfriend or wife comes out and begins to lay out a piece of cloth to display their goods. Once again we see beautiful, detailed bone carvings. They have earrings, necklaces, swords, tikis and more. Still, I do not find earrings like I’m looking for but we do find two necklaces that I love. One is a tiki and the other a whale tale. Dan negotiates a deal and we buy them. While we are waiting for the carver (I never understood his name), his lady goes out into their yard and picks a bunch of fruit. She brings us a bag with pamplemousse, limes, oranges and more. It’s a gift for us for buying their carvings. We are humbled by their kindness. We spend the rest of the afternoon on Dazzler in our hammocks just enjoying the beautiful bay and amazing views. Soon it’s time to head to Riva & Poi’s for dinner. We have no idea what to expect but we know it will be an adventure. We get to shore and head over. She told us between 1730 & 1800 and of course Dan will make sure we are there exactly at 1730. On the way there we pass this covered shrine area where the villagers have gathered for a religious service. They are singing in Marquesan and it’s lovely. We stop briefly to enjoy the music but we can’t stay because Dan is watching the time and doesn’t want to be late. We reach Riva’s home and are the first to arrive, of course. Riva greets us at the rock steps leading up to the covered porch. We take off our shoes, as is custom, and walk inside. She tells us to have a seat at the picnic table. Then she comes over with some small, mismatched glasses and asks what we would like to drink. She has this bottle of what they say is like lemonade. It’s made from this fruit here. I’m not certain but I think it’s called Cortiso. It’s a bizarre fruit when you open it. It has these black seeds that are covered by a white, jelly like substance. The taste is very nice but it looks a little strange. Anyway, they put it in water and it’s a pretty nice tasting drink. While we wait for the other cruisers she’s invited to arrive she gives us a tour of their backyard. It’s not really a yard as much as it is a garden like environment of dirt paths snaking their way around the fruit trees to a shed where Poi works making his carvings. Throughout there are tikis and shells and other ornamental things that add interest. There are flowering trees and plants providing dashes of color. It’s really quite lovely. It’s very interesting to see how these people live. They are definitely one with nature here. I’m not certain I could live quite as simply as they do but I do truly appreciate the fact that they do it and with a smile! Before long another couple arrives. They are French but speak very good English. The man seems to be a bit more friendly than his wife so we make some small talk. Soon six other men arrive. All are French but one man in particular has lived in Miami and New York for years so they seat him at the end of the table with us. He has a slight French accent and his English is perfect. We have a very enjoyable time speaking with him throughout the evening. Riva has a small card table that she sets the food on and everyone serves themselves. She has poisson cru (fish in coconut milk), goat, grilled chicken, small whole fish, a salad, breadfruit made two ways and more. Breadfruit is interesting. They serve it mashed, which has the color and consistency of mashed potatoes but they don’t put anything on it. I suppose with some butter and salt it could be pretty good. They also fry it like French fries, which would be really good with salt and ketchup but alas, they serve it with nothing so it’s pretty bland. As I come up to get a piece of goat there are no serving utensils. Riva tells me it is fine to use my hands. Okay, then, when in Rome. I reach in and grab a piece. And, I take a bit of everything except the whole fish…I’m okay with trying new things but I draw the line at eating anything that is looking up at me! There are only two knives on the table for ten of us. The French lady has already taken control of the knife at our end of the table, so I pick up my goat and tear it into pieces. She looks at me like I’m some heathen and shoves the knife in my direction. Hey, Riva said using your hands is how they do it, so don’t look at me like that lady. Like I want to use a knife that you’ve been using on your food anyway. “No thank you.” I say calmly. She turns to the other end of the table and never acknowledges me again. Whatever, I’m here doing it like the Marquesan people and I’m definitely not here to impress you. You’d think these French people haven’t eaten in weeks. They all, and I mean, all, go back three times for more food. Even the woman is scarfing down food like she won’t get another meal for a week. I am utterly shocked at how much food these people can put away. It reminds me of people at those all you can eat buffets back in the states. You know, eat every possible thing just because you can. After dinner Riva brings out two platters with mango, heart of coconut and orange slices. The mango and orange slices are beautifully presented over the bed of coconut. If you’ve never had heart of coconut, it’s very interesting. It’s sweet and spongy, not like the flakes you typically think of when thinking of coconut. We all eat up the fruit and the French lady instructs Riva to give her all of the leftover coconut heart. Really? I mean I realize we’re paying for this meal but she never asks if anyone else would like to have it, she just assumes it is hers. This is part of the reason I’ve become so disenchanted with the French from Europe. The ones we’ve met here seem to have this “It’s all mine and I’m entitled to it” attitude. Oh well, if we want more coconut, we’ll actually buy a couple. Our dinner there was interesting. The food, well, it was okay. I did learn that I truly love goat. Who would have thought that? I think the food would have been better if it was hot but it seems it was all made ahead of time and so it was lukewarm at best. I did LOVE the dressing she made for the salad. It is made of puréed mango, lime juice, vinegar, oil and Dijon mustard. It’s DELICIOUS! I’ve found that this is the dressing they use everywhere here in the Marquesas. I’m in love! I will say I’m glad we went to this dinner. It was an experience and one we will not forget. Tomorrow we are off to Tahuata again as we head north. From there we will spend some time on the northern side of Hiva Oa before heading off to Nuka Hiva. There’s still so much to see before we make our way to the Tuomotus. Lots of fun times ahead.